As time loitered in the front hallway, he could discern that the blurry shadows in the room were deepening…the sun moved on to its daily descent. Another day was ending, not unlike the many days before. Since his discharge, Gaetano had learned to rely on the sounds of her return, as he could no longer see his bride of many years. The doctors didn’t know that to share hypodermic needles among the many soldiers in their sick ward, was to invite a different enemy into the lives of these battle-scarred boys. When the infection finally left his body, it took his sight as well. Now, he found himself at home many days, waiting. His wife working in the factories down by the river, he could no longer provide well for his family; but his Grace did instead. The dark wooden intricately carved clock struck 6:00pm; its sweet clear tone hammering into his fractured psyche and bubbling up deep memories of Sicily. He had commissioned that clock to be hand-made. He had brought it all the way across the ocean, to his new country, as a reminder of past and to mark the time in the present. Gaetano stood and felt his way across the room to the clock, running his finger down the cut grooves of swirls in its side. It was time to rewind it. He reached around the back and felt the well-known notch which housed the brass key. Retrieving it with expert movement, he swiftly felt for the latch at the front of the clock opened its casing and wound it 1-2-3-4 times, counter clockwise. 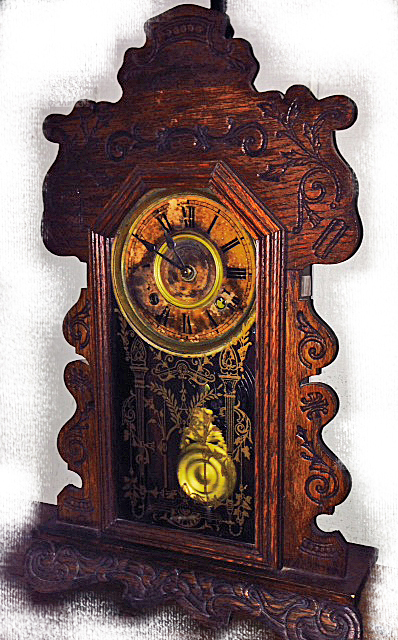 The clock chimed its assent, rewarding its owner with the clean sound of its well made works. “She will be home soon,” he said to no one. Indeed, he was right, as soon as he found his way to the kitchen to bring the glasses and the wine to the table, she was there. Grace opened the door, entering the smallish kitchen; she clutched her special dinner purchase in brown wrapping. With excitement, she brought to him the delicious chunk of Pepato cheese she had bartered for at the corner shop. “We will have it with the pasta tonight, but here, have a bit with your wine. It is such perfect texture, it must have been an Italian sheep who gave the milk for this cheese,” she said with a twinkle in her eye. Gaetano’s clock struck 7:00pm as the rhythm of night began. Everyone was busy, each had a task to do and as they worked and chatted, reassessing their day and sharing news of their Italian community, they finally all gathered around the dinner table. Giving thanks for His blessings in the name of the Father, the Son and the Holy Spirit, the family was whole again, and Papa didn’t have to see that to know it. It was after midnight when young Joe let himself into the back kitchen door. He needed to clean his hands, ever so quietly, to wash the blood away from the skinned knuckles. He picked up a shiny butter knife and tried to look at his eye…uh,oh, he was bruising – Papa won’t see it – hopefully his sisters won’t say anything. He reached into the ice box and found a loose icey chunk and wrapped it in a mappina and applied it to his tender eye. He was hungry. He opened the larder and found a chunk of mortadella, grabbed an apple from the fruit bowl and went to tiptoe up the back stairs. “It is late, it is after midnight. Where have you been”? Joe cursed silently under his breath, how did he know what time it was? Papa is blind, he thought. The young man skulked into the living room to greet his father, sitting there in the dark smoking a cigarette. “Papa”, he asked, why are you sitting here in the dark”? “It’s all dark to me Giuseppe,” calling his son by his Italian name. “What difference does it make? But answer the question, you are late and you have disobeyed me…and why are you bleeding”? Joe’s eyes widened, “How did you…” his voice broke off. Papa answered, “I smell the blood. When you lose one sense, the others sharpen. Now tell me, why are you late? Have you been rumbling with those Irish-boys again”? Gaetano’s clock struck 1:00 am. “Get to bed”! He ordered his oldest child. We will speak about this tomorrow”. Papa put out his cigarette and felt his way upstairs. As he softly lay down next to Grace, he thought to himself, “He is too much like his father,” and chuckled himself to sleep as he heard the clock faintly chime half past the hour. Agnes cried out in pain as she screamed for Joe to “Come, now”! Papa’s clock, now sitting on Joe’s mantle chimed an urgent 3:00pm. “Come now, Joe”! It called. “Come now”! He ran into the den and saw his wife, holding her enlarged stomach and sped into the kitchen to call the doctor. Dialing the phone as quickly as the rotor would allow, he finally heard the voice he was praying for. The clock chimed 10:30 pm and the wailing sound of the 3rd generation of sons reverberated through the house. Born on a kitchen table, the hefty baby boy was ready to take on the world as he was placed into his father Joe’s hands. It was a cold January day when Joe Jr. came to his father’s house. It was nearly empty. So was his heart. It seemed to have only been a few Sunday’s past since he sat there in the living room, sharing a glass of Chianti with his dad. The clock had chimed the hour – time for the football game. But that was then, now here it was, Papa’s clock. Passed from Papa, to his father, a.k.a. Pamps and now belonging to Joe Jr., he picked up the nearly 100-year old clock gently. He wrapped it in a blanket along with a framed tin-type picture of his grandfather posing in his soldier’s uniform. The two belonged together. They were family. Alonzo and his younger brother carefully placed the old wooden clock on the side-bar in the sunroom. They studied the beautiful carvings, the gilded swirls in its glass casing. They were fascinated with the springs they could see inside. Their father, Joey, watched his sons. Smiling, he thought of his great grandfather. “May I wind it Dad?” Alonzo asked. The 5th generation of sons carefully followed their father’s instructions. When the rewinding was finished, Papa’s clock chimed the hour clear and sweet – and somewhere up in Heaven, Papa and Pamps heard it and smiled.